Preseason games begin in San Diego on August 24th, and include just three games in Portland this year, while also playing three each in San Diego, Honolulu, and Boise. Head Coach Jeff Baxter wrote: We have an awesome opportunity to grow being on the road for the majority of the preseason before we dive into the always tough WCC schedule. We are excited for the challenges of our 2018 season." The Pilots WCC schedule begins at home against perennial power Pepperdine on September 20th, and includes the usual home-and-home with all nine WCC opponents. Volleyball started their season 3-0 in San Diego by beating CSU Bakersfield (3-0), Campbell (3-0), and San Diego State (3-1). I have no idea how good each team will be this year, but they all had winning seasons last year and the Roadrunners were an NCAA tournament participant after being crowned WAC champions. We will have another opportunity to face SDSU in Hawaii later this season. Our former head coach has also started his season 3-0 at USC, which included a ranked win against Creighton. Maybe we can get on their schedule in the future. We benefit from another high level transfer:Shayla Hoeft, who transferred from Nevada, after high school in Hawaii. Good wins, and some reason to be optimistic for the coming year and the difficult WCC schedule. Hoeft was apparently named the tournament MVP. Not bad for a Pilot becoming acquainted with her teammates and their play. Shayla Hoeft also named WCC player of the week. DD, do you happen to know the reason Shayla transferred to Portland? Anyone else? Curious about it. Her Nevada bio says she chose Reno because of family there. That may have changed. Also, I think there are more students from Hawai’i here. wrv wrote: do you happen to know the reason Shayla transferred to Portland? Anyone else? Curious about it. Better program in a better conference? A very solid win for the Pilots last night over Wyoming in 5 sets. Wyoming came in also undefeated, including a win over #18 Colorado. The Pilots dominated the first set, battled through the second to get a 2-0 lead. The 3rd set was intense and back & forth, and the Pilots had a couple match points before Wyo was able to win the set 28-30. Wyo kept the momentum in the 4th winning easily as the Pilots were out of sync and couldn't get good passes to set up their offense. The 5th set was back & forth, and Wyo held their last lead at 9-10 (and were clicking) before the Pilots won 6 of the last 7 points to win 15-11. Hoeft and Pukis continued to lead the Pilots' attack with Thompson looking good at setter. The recruiting of transfer Hoeft shows Coach Baxter is keeping up the recruiting excellence of Crouch! Lets hope the growth of the program continues! Well yeah, but also just a better fit overall. Remember, Shayla went to a very small private high school (450 students grades 6-12) on Maui, was recruited by the Pilots and Coach Baxter, but made the hard choice to attend a state university with over 22,000 students. And yes, she is also excited at the prospect of playing with one of her club teammates, Kassidy Naone. The Pilots won 3-0 today against Long Island University -- Brooklyn. Started out slowly in the first set, getting down 18-12. Then used a 13-3 run to win 25-21. Won the next two sets pretty handily. Blocking is hugely better than last year (which was a weakness). Reich has improved, and the presence of Hoeft and Barker as MBs has made a big difference. Last year, we were often out-blocked significantly. This weekend, we were essentially even in blocking in the first two matches, and out-blocked LIU 11-3 in the final match. Lots of quick-set kills in the middle. The timing between Thompson and the MBs (especially Barker) is really there. Don't think I've ever seen the Pilots do it that well. Izzy Guzik is the real deal. Played all six positions in the rotation. Did well in serving, serve-receive, blocking, hitting. She was a big contributor to this weekend's sweep. On the down side, the Pilots gave up a lot of points in the middle, not doing a particularly good job covering tips or setter-dumps. eProf wrote: The Pilots won 3-0 today against Long Island University -- Brooklyn. Started out slowly in the first set, getting down 18-12. Then used a 13-3 run to win 25-21. Won the next two sets pretty handily. Pilots with a huge win against Hawaii in another rollercoaster game 3-2 to stay undefeated at 8-0. Hawaii was a notable nationally top ranked program in the past under former coach Dave Shoji, but his retirement last year + underwhelming results by his replacement has caused it to sort of regress into a "rebuilding" phase. Still a very tough opponent but nowhere near their former glory. Dedicated fanbase is still very supportive though; local commentators mentioned pre-game that the Pilots may be used to playing in front of 400 people, but not 4000 people. When Hawaii starts to rally, the fans cheer loud. Like, Gonzaga MBB loud. Close back-and-forth first set, with Hawaii running away at the end. 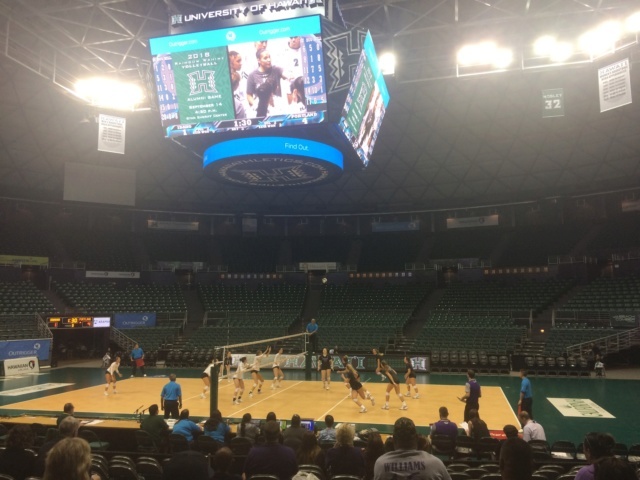 Then the Pilots utterly crushed the second set by double digits, limiting Hawaii to 11 points (Local commentators said it was least points in a set by Hawaii since 2008 in a 25-9 regional final loss). Another close back-and-forth third set with Portland going on a 9-2 run at the end. Sloppy start to the fourth set with Hawaii starting 5-0 before Portland made things close again. A big notable down side I noticed was near the end where they gave up like 3 service errors in a row, allowing Hawaii to take it to a fifth set. Essentially all Pilots in the fifth set. Home town (or rather home state?) heroes were the stars of the game. Shayla Hoeft was an absolute beast (16 kills, 8 blocks, .536 hit %) that Hawaii had no answers for. Carey Williams came up big in clutch rallies with 28 digs. Guzik and Pukis also with great performances with 15 kills and 44 assists. Blocking/defense was a big factor in the win (Pilots 14 vs Hawaii's 5 on blocks), something the local commentators took note of. Overall serving was good, commentators noted it was very accurate. Aces to errors ratio was around 1:1 in the first few sets I think, just got really skewed with that fourth set so it was 3:13 at the final. TIL Portland is running a fast offense. 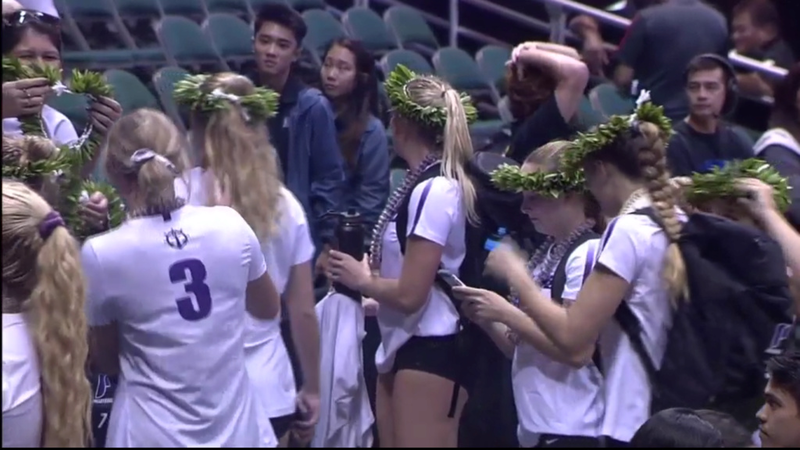 Hawaii Portland faithful gave out leis/head leis (haku) to the players post-game. Camera also had shots of Carey Williams' family which I didn't get. 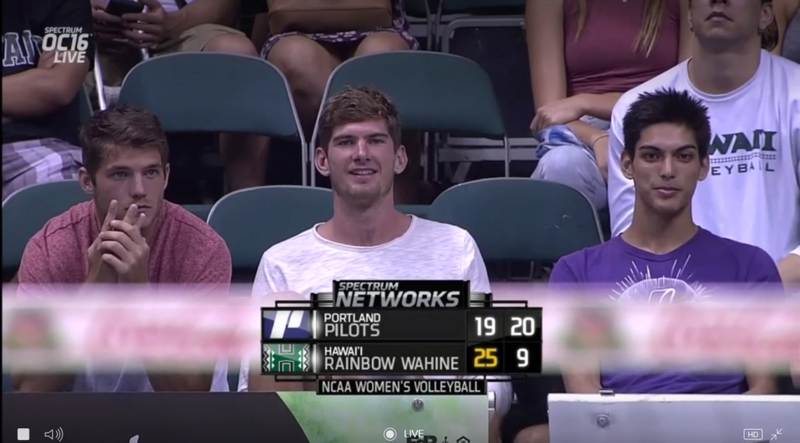 Hawaii VB player Cole Hogland (younger brother of MBB player Hugh Hogland) defected to Pilot Nation for one night. Not sure if their last game vs Idaho will be streamed, but hoping for another tournament sweep! Pilots are 8-0!! Obviously the best start ever for UP Volleyball. Excellent rundown SV, really nice to get a Pilot's perspective, and pictures too. No, apparently there is no streaming of UP's game against the Vandals...stats only. As UP has been attracting students from Hawaii since the 1950's and as over 10% of the current student population at UP is from Hawaii, it is probably no surprise there was a good turnout of UP supporters at the game. A little surprising, however, that Hugh's brother gave up his Hawaii shirt for the Purple, but you've got to love it. Keep up the good reporting, SV, remember the MBB team will play UH on 11/9 and the WBB team will play UH on 11/16. Not just that, but UP's baseball team will be in Hawaii this coming spring and the MBB team will return to Hawaii in December 2019 for the Diamond Head Classic. 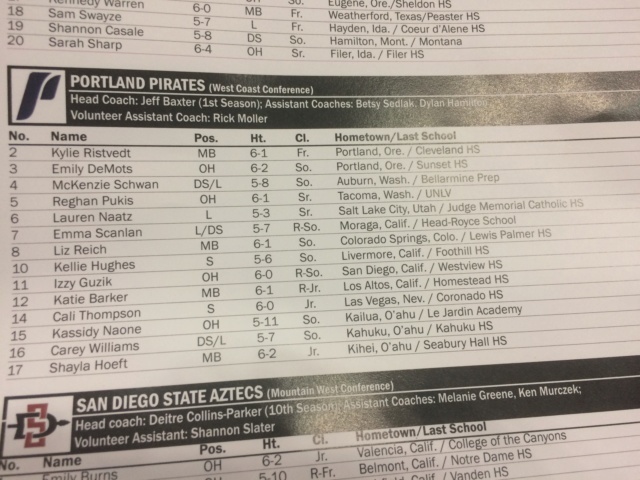 The lineup cards being handed out at the Stan Sheriff Center mistakenly listed Portland’s nickname as “Pirates” and not “Pilots.” Either way, Portland continued to make its first Pacific Ocean crossing a success. Are we a volleyball school now? It’s been great fun to watch this program gradually improve itself and I couldn’t be happier for everyone involved. The real test will be WCC play, because our conference is deep in volleyball. BYU looks unstoppable. SouthCarolinaPilot wrote: The real test will be WCC play, because our conference is deep in volleyball. BYU looks unstoppable. Portland checks in at #43... good for 5th-best in the WCC. I know these numbers don't mean a whole lot because it's so early, but still... we'd be the #1 or #2-ranked team in every conference in the West (outside of the Pac 12). Our strength of schedule is significantly weaker than all other WCC teams, so we definitely still need to prove ourselves. Still, it's pretty darn encouraging to be winning all the games we "should" win while also beating some really solid opponents in Wyoming and Hawaii. We've got one more big non-conference test ahead of us in Boise State... if we can beat them too, it would be a very promising sign for also being competitive in WCC play. 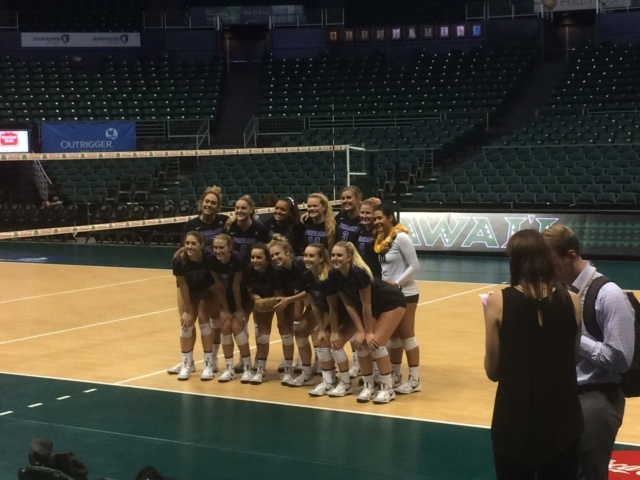 Portland swept Idaho 3-0 to win the Outrigger Volleyball Challenge and go 9-0. Last minute changes happened, and I actually ended up going to the game myself. Game was free, pretty empty save the small group of Portland Hawaii fans. Not a very cheer-y person myself, ended up just clapping a lot in the back. Yes, the "Portland Pirates" gaff mentioned before is real. I think I saw the team making pirate hook hand signs pre-game. Maybe Wally should start wearing an eyepatch and hook arm to every home game. Not much to really talk about, the game was definitely not the rollercoaster that was last night's game vs Hawaii. First set was back-and-forth with the Pilots pulling away at the end. Pilots pretty much dominated the second and third set minus a couple small runs from Idaho. Pukis was the kill star of this match with 15 kills, Hoeft and Reich shared 10. Blocks not as much as last night but serving was a lot better. This will most likely be the only UP game I attend in Hawaii this year as I've decided to leave the rock at the end of the month for better opportunities. I prefer watching games on a stream w/ commentary anyway, but I'm glad I was able to take the opportunity to see them in person. Let if be known that our undefeated volleyball team has received FOUR (4) votes in the AVCA poll! That has to be a program first, right?! I know last year we were ranked in some sort of mid-major-only-poll. No surprise that BYU is first. USD sneaks in at 23. Also of note: Oregon is ranked while Oregon State and UP are receiving votes. Are we a volleyball state? That puts us ranked at #41 in the country. Incredible. Just thought of a question for the PN scholars out there... has UP ever had four teams simultaneously ranked/receiving votes in national polls? Right now we've got Men's XC (#3); Men's Soccer (#18); Women's XC (RV, #31); Volleyball (RV, #41). I'm sure there were plenty of times both soccers and men's XC were ranked, but I don't know if women's XC ever got to the point where they were receiving votes. Probably they have, but I can't think of when. And I certainly can't remember volleyball ever getting votes. Stonehouse wrote: Just thought of a question for the PN scholars out there... has UP ever had four teams simultaneously ranked/receiving votes in national polls? Today should be a real test of the team with two matches today. First up is Sacramento State (5-6) and then Boise State (6-2) at 6:30. The match against the Broncos is the one that has me nervous, but Boise State will be playing against CSUN at 2:30pm, so they will actually have a shorter rest time than us! Agreed--today is a big day for the Program. I am surprised that BSU gave us the longer rest! 11am PDT vs. Sac St: The only opponent in common so far is Seattle U. The Pilots won @SU 5-0 in an exhibition match, while the Hornets lost at home 3-2. Sac St has defeated UC Riverside (3-1), Nevada (3-1), UCSB (3-0), McNeese St (3-1), Utah St (3-1). The other losses were to CSUN (3-2), Arizona (3-1, interesting that they were able to take a set here), Santa Clara (3-0, interesting? SCU was picked to finish 6th in the WCC coaches poll), Denver (3-2) and UC Davis (3-1). The loss in straight sets @ SCU raises a question, but grabbing 1 set from Arizona is also intriguing. Live video and stats appear to be available on the UP site. 6:30pm PDT vs. BSU: The Broncos are 6-2, with wins over LBSU (3-2), Portland State (3-1), UW-Milwaukee (3-2), UC Riverside (3-0), Idaho St (3-1). At the same tourney at Santa Clara, BSU swept SCU, but also lost to UCD (3-1). The other loss was last night at home vs #13 Washington, where they were swept but kept it very reasonable (25-22, 25-23, 25-17). Obviously BSU is our toughest opponent to date, so this will be a great test of where the program stands heading into WCC play next week. Update after the Sacramento State match: 10-0! We swept the Hornets: 25-16, -23, -18. Between these two volleyball matches and both the soccer teams playing today, I think I might melt. The Pilots improve to 10-0 with a 3-0 whooping of Sac St, 25-16, 25-23, 25-18. The bits that I was able to catch showed that it wasn't even this close, but the Hornets were scrappy and able to save several points with desperation defense to offense. 11-0 with a 3-2 win over Boise St. Won the first set, lost the next two, came back to win the last two.